The Pet Fox: Pet Fox Stories: Attack Of The Grocery Bag! Pet Fox Stories: Attack Of The Grocery Bag! This is a story from the Sybil's Den Message Boards. Sionnach is another red fox, about Gizmo's age. I'm not the one who wrote this, and I used it without permission; I will take it down if Stacey asks me to, but I thought it was too funny not to share. "Picture if you will... a mild mannered fox living in a cabin in the woods of Wyoming (with his 2 people, 2 dogs and mean, mean cat). This fox finds it FASCINATING when his mom comes home from work because she works at a "whole foods" type store and almost every day brings food & other exciting items home in these cloth bags of various sizes. Invariably, even though she KNOWS the fox will immediately jump on the kitchen table to investigate, she places these bags on the table nonetheless. The following ensues... as she takes off her coat she says, "Sion, leave it those aren't for you". Sion takes three steps back, looks at this woman and then proceeds to go right back to poking his needle nose into the bags. This back and forth continues until all groceries, etc are put away and the cloth bags are hung back out in the mud room away from fox teeth, pee, etc. EXCEPT - one day last week, one of those reusable bags you can buy at the grocery store was left on the kitchen table (you know the ones - usually green or black and you can buy them for like a dollar at the store). While the woman was still in the kitchen/ living room and the man was in the bedroom, the bag attacked!!!! The following events occured... Sion jumped off the table and the bag followed! Then he ran to the "baby gate" (which is up at times to keep the dogs from eating his food) and paused - thinking he'd lost the bag. The bag was still there! He then jumped over the gate, jumped up on the bed, jumped off the bed back over the baby gate into the kitchen - doubled back - jumped back over the baby gate - the bag still attached - then dove under the bed. Under the bed he successfully "lost" the bag. At this point his 2 people were laughing so hard tears were streaming down their faces. The fox was not amused and when I said, "Can you get the bag out from under the bed?". The reply from the "man" was (through laughter), "Are you nuts? I'm not sticking my hand under the bed 'til he comes out!!" The moral of the story is... foxes should not stick their noses in things that don't belong to them - they might attack back! PS - Sion still jumps up on the table to examine the bags EVERY time I come home! 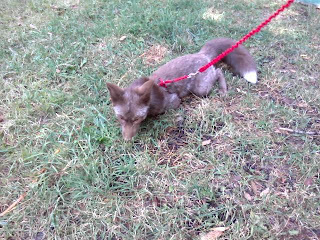 PPS - No foxes were harmed in this story and Sion only had it stuck around one back leg." Haha poor Sion. That must have been terrifying! My cat is also obsessed with reusable bags of any kind be they grocery bags or backpacks and will 'fuss' (paw insistently) until it is put down to wear she can park her regally large backside on. And yet is absolutely TERRIFIED of paper bags . . .
My cat is part feral and startles very easily, however you would never know this the way she is with her 2 people (easy-going, affectionate, etc..) When there is a plastic Walmart bag though she has a completely a different story.lol! When I read the story above, it reminded me of Buffy's nosiness after I returned from the grocery one day. The only difference is I had walked out of the room when I heard her screaming like they do when they are in pain (I thought)..lol. She ran through the house with the grocery bag following her through the house, down in the basement, through the house again, screaming, and going so fast neither one of us could catch her to remove the bag. Thank goodness it came off on its own because she sounded like another animal had her by the tail....lol..lol..! !